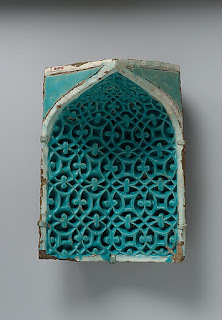 After an eight-year renovation, the Met's Department of Islamic Art reopened its fifteen galleries on November 1st. Known as the New Galleries for the Art of the Arab Lands, Turkey, Iran, Central Asia and Later South Asia, the rooms consist of some 1,200 objects from a rotating collection of 12,000. 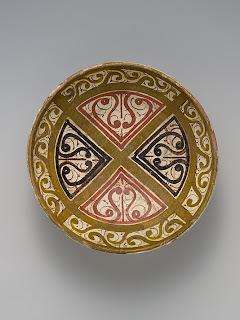 The organization of the galleries by geographical area aims to emphasize the rich diversity of the Islamic world by underscoring the many distinct cultures within its fold and its interconnectedness with other cultures. They boast architectural splendours, including a Moroccan courtyard, a room dedicated entirely to carpets (it evidently holds so many carpets that it muffles sound), as well as objects ranging from the most intimate to the most monumental. The Damascus Room was a room in a big Syrian house in the early 1700s. Workers took it apart and shipped it to New York, then rebuilt the room inside the museum. Experts repaired and restored each element of the carved and painted wood and the splendid tiles in the room. As well as precious manuscripts, calligraphy and pottery there are paintings with images of animals, of dragons, of flowers, and realistic paintings of people. Navina Haida, one of the curators, says "the images are surprising because of the common notion that Islam forbids imagery — but that's not quite true. Yes, images of living things are discouraged in the religious sphere. But, they appear widely outside that context, especially when it comes to the illustrations of books and poetry and literature." 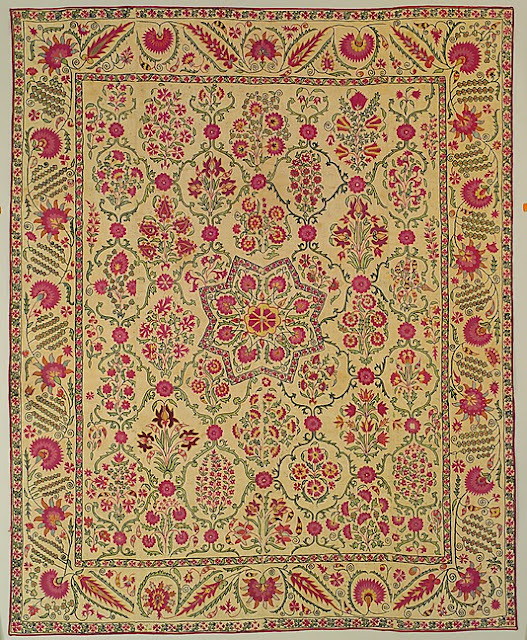 There are over 140 Uzbek objects in this collection: tiles, carpets, textiles, manuscripts, paintings, and jewellery. The New York Times has an excellent back story about the galleries and of course the Met's web materials are outstanding.